There are approximately 600 million housecats in the world and all of them evolved from five lineages, traced through analysis of mitochondrial DNA to the Near East region of the world. The climate in the Near East is dry and hot, with little to no vegetation and with very low annual rainfall. Water is scarce, and animals in the region have had to adapt to these climate extremes with very specialized systems. For cats, this means a protein-only diet, obtaining nearly all of their moisture requirements from the foods they eat. Many of the health issues we see in domestic cats are a direct result of dehydration. Most of these can be avoided, and sometimes repaired simply by switching the cat to high moisture, highly digestible raw meat diet. Cats are Obligate Carnivores, or “true” carnivores, which means that they depend only on the nutrients found in prey animals for survival. They have a need for an Essential Fatty Acid, or EFA, called arachidonic acid which plays a vital role in fat utilization and energy production. This particular EFA is found primarily in raw meat. Cats do not actually require any plant material at all in their diet to thrive. In fact, a diet high in vegetable matter can lead to an overabundance of glutamic acid which will cause sporadic vomiting and a thiamine deficiency. Obligate carnivores will, in very few cases, eat plant material (especially that found in the stomach contents of smaller prey that are eaten whole) even though they lack the digestive enzymes to break down and metabolize such foods. Additionally, cats cannot synthesize certain essential nutrients from plant matter, such as taurine and retinol (Vitamin A), and must obtain them from the proteins they consume. Another characteristic of true carnivores that cats exhibit is a very short, straight digestive tract. This is because cats do not need to break down tough plant cellulose. In fact, the higher the amount of fiber in the diet (plant or grain), the higher the level of taurine is required in the diet. In the wild, and even in their own backyards, cats are very good hunters and can easily catch the prey they wish to. Cats differ from other carnivores, such as dogs, in that they do not have to scavenge for other food if they do not catch the prey they were hunting. Dogs are somewhat sloppy hunters and do not always get to eat their preferred meal and so have had to adapt to eating less-than-optimal foods that they can scavenge, like berries or roots. Cats would rather forgo eating altogether if they cannot have the food they wish to eat. One result of cats being such successful hunters is that they are “imprint eaters”, and as such tend to imprint of the foods fed to them as kittens. Though this can make switching their diet more of a challenge, the health benefits far outweigh the temporary frustration of making the diet switch. The differences in hunting methods/success and anatomy between dogs and cats mean that they have very different nutritional needs. 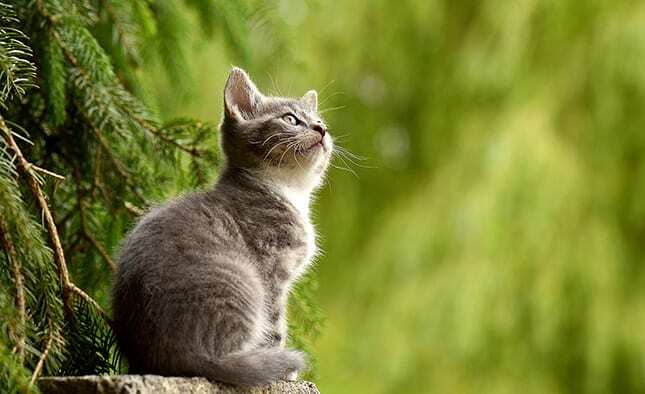 Cats must obtain most, if not all, of their nutrition from protein to thrive, whereas dogs can obtain nutrition from a few other sources in addition to proteins. It is for this reason that we promote the philosophy of feeding cats and dogs a species appropriate diet, specific to their unique needs. Northwest Naturals Cat Formulas do not contain any produce. The Dog Formulas contain approximately 18.5% produce. It would be difficult for a cat to thrive on a diet with such a high percentage of produce. When a cat consumes large amounts of materials that they are unable to digest, their digestive systems are overworked, their metabolism is exhausted, and extra fat and toxins are stored. The most important thing to remember when feeding cats is that we must try to cater to their needs as much as possible and provide a diet that is as close to what they would eat in the wild as possible. Northwest Naturals Raw Frozen Cat Formulas were specifically formulated with this in mind and provide the highest nutritional value possible for your feline pet.